O: I love you Setsuko, and my heart breaks every time I remember that you died and that you were based on a real person. So, yes! Another vector, which, although I like to say I hate it (vectoring), has, I guess, become my new style. Vectoring with painted backgrounds, and hopefully I'll continue to progress in this field of designing. For this being only my second vectored/painted wallpaper I am not disappointed at all! So, on to the wallpaper. Everything is hand done again, with the help of the cheesy grass brush. I tried to gaussian blur all of the grass to try and distract it's distinctiveness. The vector overall was not hard, but Setsuko's doll was hard for me. Gah ... Oh, I'm gonna cry thinking about Setsuko! I cried a lot while making this, thinking of how bright her eyes were. Sadly, this book-based movie was based off of the author's life, which makes it all the more sad. 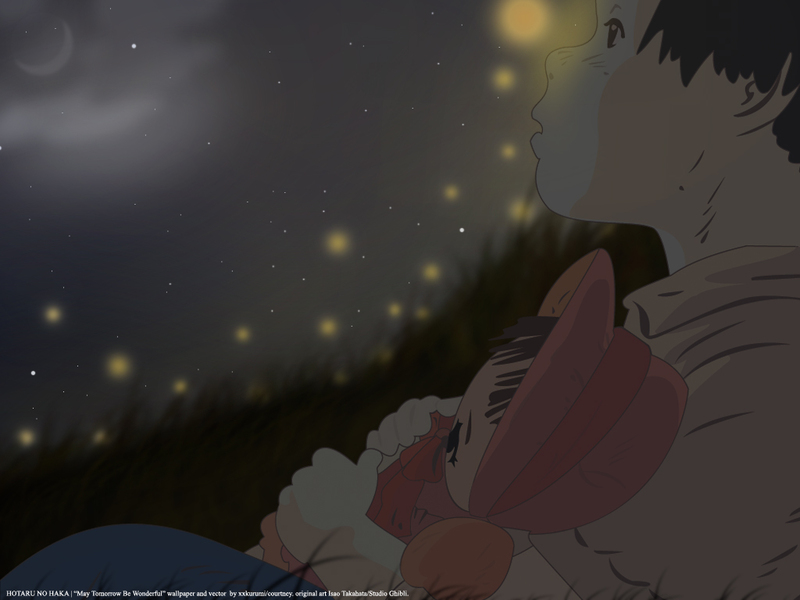 So the wallpaper basically focuses on Setsuko and the fireflies, which she just loved. DEDICATED: To http://sinever.minitokyo.net/ for inviting me to Vector-Wallers and creating beautiful vectors that helped me overcome my fear of vectoring and inspire me.